Just as they have for the over 16 years, Giraffe Web Development and Design continues to create ongoing business relationships with a clients in a variety of areas: doctors, lawyers, home builders, real estate, retail, manufacturing and others. Our clients agree that we are unique in today's market. We focus on ALL your web site's needs, providing total project management: from your domain name, web site graphical layout, web hosting, e-mail through Google Apps, content and copy consultation. We also incorporate all your social media into your web site: Facebook, Twitter, YouTube, Blogs, LinkedIn, Plaxo and others. We will also set up and help you manage a WordPress or ecommerce web site. In addition, we specialize in local SEO to help your great website show up in search results and grow your business. Let us show you how your website looks on a mobile phone and help you establish a mobile website for quicker access to your business and its services and products. 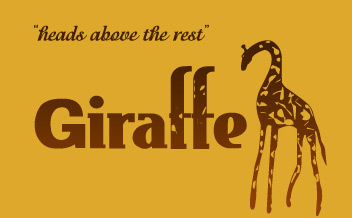 So, join us on the savannah where Giraffe Web Development and Design is "Heads Above The Rest" of all those other beasts out there! Part of the Giraffe Web philosophy also includes giving back to the community and supporting causes that are near and dear to our hearts. If you are so inclined, click here to see the charities and causes we support.